Happy Friday and thank you all SO much for your amazing comments on yesterday's Coffee Talk post. I loved reading about everyone's thoughts about those times when things just don't click—and how you get through them. It's normal, one hundred gazillion percent normal. And isn't it just refreshing to know we are all in the same boat? For today's Five On Friday, I am going to break tradition and do a themed post ... 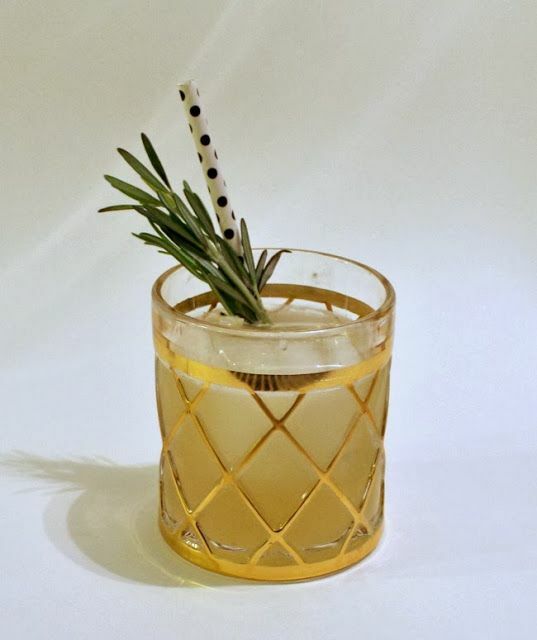 I have cocktails on the brain (six weeks but who's counting) and maybe it has to do with the warmer weather and the thought of cocktails on the patio, but I've been salivating over my Cocktail Me Pinterest board recently! Here are my top five cocktail wishlist recipes for patio sippin'. Moscow Mule. It seems like everyone started loving these after I was already pregnant. So I missed out on the Moscow Mule boat. I steered clear of them before ditching liquor because I mistakenly thought they had bourbon in them. That I just can't do, but vodka? Oh yes madam. Rose Derby. This recipe can be found on Mint Love Social Club, and she can do no wrong in my book. The cocktail queen. A beautiful blog to follow! Lavender Collins Cocktail. Not only are these beautiful, but just about anything with lavender in the ingredients has my full attention. You can find the recipe here for these delicious and pretty cocktails. Please don't be scared off by the idea of making a lavender simple syrup; it's way easier than you would think. If you can boil water, you've got this, mama. 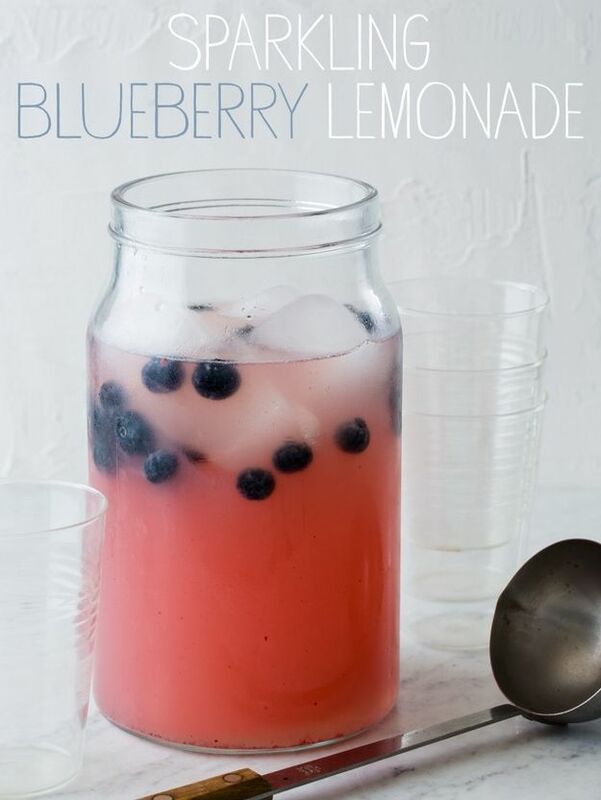 Sparkling Blueberry Lemonade. Lemons? Love 'em. Blueberries? Love 'em. Sparkling wine? Yes please. St. Germain? Now you have my FULL attention. Find the recipe here. Apple and White Pear Sangria. I'm known in my extended family as The One Who Provides The Sangria. Which is not a bad title to claim. Find the recipe here for this light and refreshing sangria recipe. And remember—red sangria may be tasty, but on a boat, it can be a recipe for disaster. Stick with white and you're ready to crank up the speed! Happy weekending to you and yours -- and I'm curious, if you were ordering one of these cocktails from a menu tonight, which one would be your choice? Hope you will link up with us today! and enter your post address below. a link back to one or all of the hostess blogs! I'll take one of each, they all look delicious! Happy weekend!! Yes please! You got me hooked on Mint Love Social Club. So many of her cocktails are gin-based and I've been off of gin since a particularly raucous weekend in Key West in 2006.... ah to be young and foolish again.... anyways, so many of her yum sounding cocktails include gin so I finally dipped my toe back into that juniper berry pool last weekend out at happy hour. In a multi-ingredient mixed cocktail, I was VERY pleased. 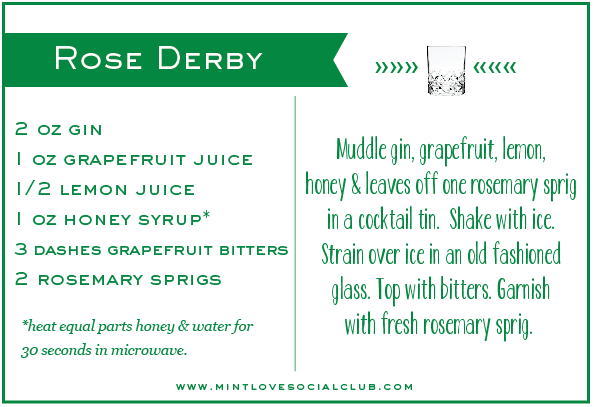 The rose derby looks delicious! Some great cocktail ideas for a party I'll be throwing around Easter. Those drinks look delish! Being from Moscow, I'm partial to the Moscow mule. Have a great weekend! Mmmm, all of those look delicious! At our wedding we had signature drinks and my husband chose his favorite drink which is a GinGin Mule. It is pretty similar to the Moscow Mule but has Gin instead of Vodka and you add some muddled mint. It is delish!! 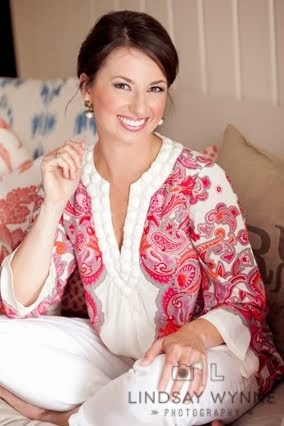 Love your blog and linking up on Fridays!! Yummm... Moscow Mules are my new favorite too. Although the Russians wouldn't be happy you posted your recipe with a Polish vodka... I love it though! Hugs! All of these sound amazong! The Moscow Mules are so good, definitely add the mint, some people omit it but it really adds to the drink. You got my hooked on St. Germain and I just love it. That sparkling blueberry lemonade sounds soooo refreshing! The Rose Derby looks almost as good as it probably tastes! I need to make those for my next get-together! YUM! I still haven't had a cocktail post pregnancy. Sad- Deeds is 8 weeks old today! I just like to stick with wine though until he starts sleeping through the night. Ha- I am paranoid about hard liquor and breast feeding. 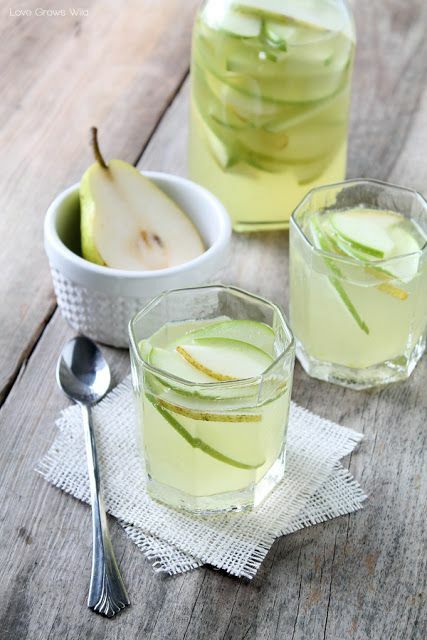 I'm digging that sangria- I've been on a pear kick lately and this may help fuel the cravings! Thanks for the new recipes- Happy Friday! These look so yummy and refreshing! I am heading to Raleigh this weekend to stay with friends and definitely might need to whip one of these up when I get there! Have a great weekend love! 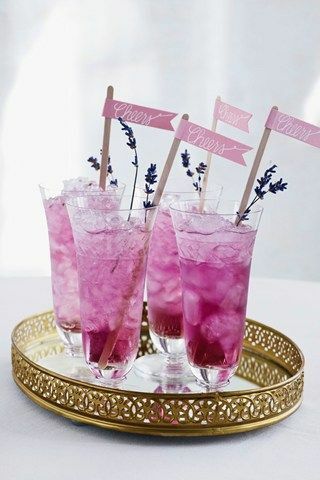 The lavendar collins is gorg, and the sangria sounds so lovely! Recipe for a good weekend! Yes!! I am loving all these choices! And how pretty are they?! I'd say that's a win-win! And now I'm thirsty and wishing I had a personal bartender making all of these fabulous cocktails for me! YUM! Yum..these all sound delish! One of my fave things to do once the temps warm up is go to happy hours at restaurants with outdoor seating! Yum to all of these!! Moscow mule is hands down my favorite cocktail of all time and the one I order anywhere I can find it on the menu! Only a few more weeks left!! 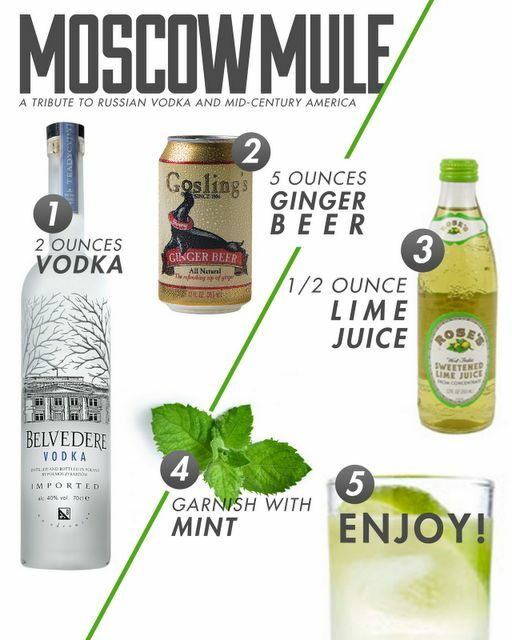 Eek I have never had a moscow mule either, but after seeing your ingredients I'm ordering one the next time I see them on the menu!